Readers of this blog may already know that I live in a densely built-up part of London, which is a very harsh environment for listening to shortwave radio indoors. I have come up with some RFI mitigation strategies, but these work best when the underlying radio signals are still relatively strong. That is because once a signal dips below the ambient noise floor there isn't much one can do to recover it. At home, I enjoy listening to "blowtorch" signals like All India Radio, Voice Of Greece and Voice of Turkey (although occasionally I try my luck and listen to weaker stations). 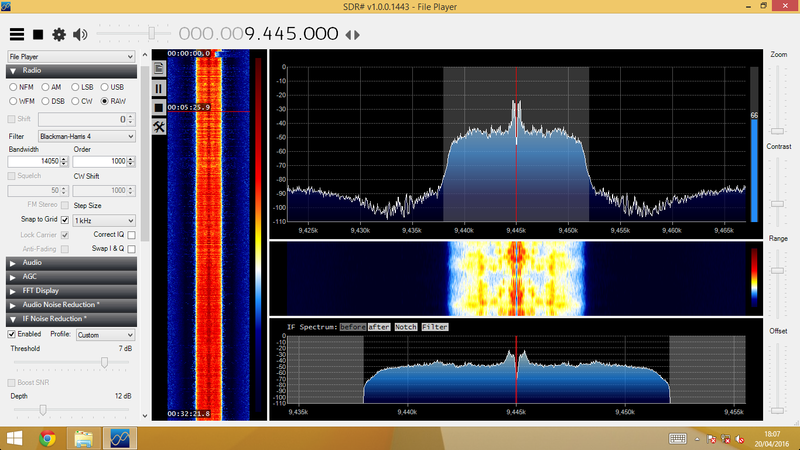 Still, sometimes the propagation is poor and even these stronger transmissions start fading into the noise. This can be especially disappointing when I start recording a particular transmission and then go off to do other things, only to find out later that the recording is heavily ridden with static. Many of my night-time recordings have ended up this way and until recently I thought that they were generally beyond "repair". Enter SDR#. It turns out that it can process a regular audio WAV file just as if it were a real-time radio signal, meaning that its noise reduction plugins can be used to clean up the sound. SDR# settings for denoising audio. Click the image to enlarge. To do this, open the WAV recording either as an IQ file or using the FilePlayer front-end plugin. Chose the RAW demodulation mode and click play. You can then experiment with IF Noise Reduction parameters to find a setting that offers a good tradeoff between the noise filter strength and the amount of audio artefacts. Although there are a few DSP audio artefacts in the denoised version, I do like the end result and I'm sure I will be repairing quite a few more of my noisy recording this way.